Get ready to make your own Giant Gummy Bears in no time. Our kit includes 3 giant gummy bear molds as well as a simple recipe to get you started. The molds are reusable so you can mix and match colors and try all kinds of new and exciting recipes that can be found on the internet. The molds are backed not only by a 30 day money back guarantee for our Amazon customers but also a 6 month manufactures warranty against any defects so buy with confidence. Please note that these big gummy bear molds are to be hand washed only and should not be placed in the dishwasher. These Giant Gummy Bear Molds are perfect for making large hand sized gummy bears for any occasion. The package includes 3 plastic molds which will make gummy bears that are 7 1/4 inches tall by 4 3/4 inches wide by 2 1/4 inches deep. The perfect size for an adult to hold in their hand or for a child to carry around in their arms. We have included a basic gummy bear making recipe perfect for making large gummy bears but these molds should work with any of your favorite gummy bear recipes as long as you scale the recipe to the proper size in order to fill the mold. 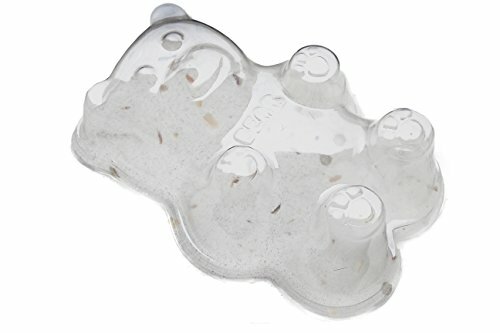 These giant gummy bear molds have nice details including eyes, ears, nose, mouth and paws in order to make a perfectly detailed large gummy bear. Great fun for the whole family. Perfect for gifts parties and party favors. Each mold is backed by a 30 day money back guarantee for all of our Amazon customers as well as a 6 month manufacturers warranty so buy with confidence. If you have any questions about this product by K.O. Enterprises, contact us by completing and submitting the form below. If you are looking for a specif part number, please include it with your message.